Word Search with Vocabulary about the Kitchen in Spanish. Sopa de Letras – Vocabulario relacionado con la cocina. 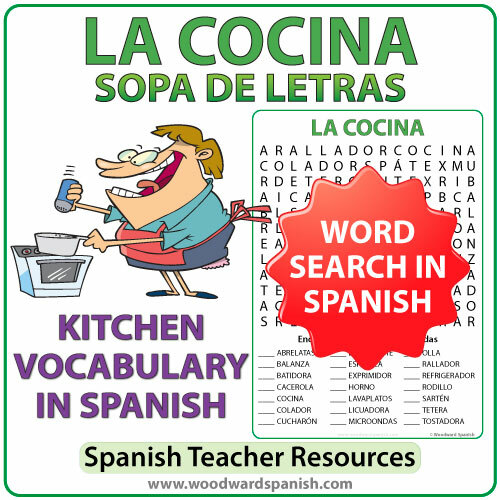 Word Search with Vocabulary in Spanish about items you can find in a kitchen. This word search contains the following 21 words: abrelatas, balanza, batidora, cacerola, cocina, colador, cucharón, detergente, espátula, exprimidor, horno, lavaplatos, licuadora, microondas, olla, rallador, refrigerador*, rodillo, sartén, tetera, tostadora. * Due to regional differences in Spanish, we have three versions of the word “fridge” in Spanish. 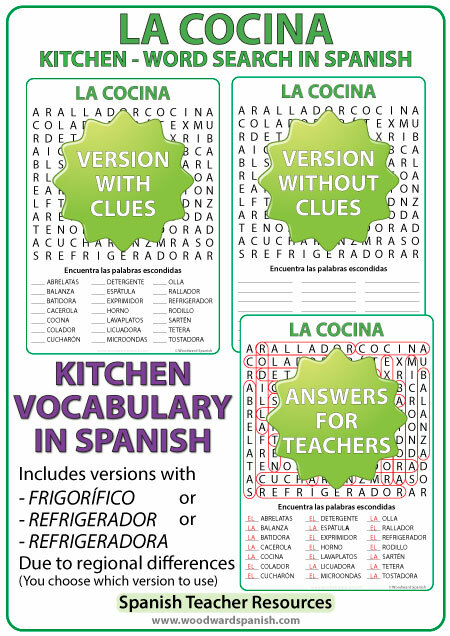 One word search contains refrigerador, another version has refrigeradora instead, and the third version is with frigorífico. You decide which word you would prefer to teach and use the respective word search. All other clues remain in the same position, only the Spanish word for “fridge” changes a little. This resource is great during a Parts of the House in Spanish unit. One worksheet is with clues at the bottom of the sheet. Since all clues are nouns, we have also included a space before each word where students need to write its correct definite article (EL or LA). One worksheet is without clues. There are lines (spaces) where students have to write the Spanish vocabulary about the Kitchen that they have found in the word search. This worksheet is good for students that have already seen this topic or are normally fast finishers. This Sopa de Letras is ideal for Spanish 1 students or higher. Sopa de Letras usando vocabulario relacionado con la cocina en español. Esta Sopa de Letras contiene 21 palabras: abrelatas, balanza, batidora, cacerola, cocina, colador, cucharón, detergente, espátula, exprimidor, horno, lavaplatos, licuadora, microondas, olla, rallador, refrigerador*, rodillo, sartén, tetera, tostadora. * Hay una versión con la palabra refrigerador, otra con refrigeradora, y otra versión con frigorífico.